September, for me, is not only the most creative month of the year, but it means also (new) cozy Fall outfits and wardrobe cleanings! If I like finding new pieces of clothing/accessories, I love even more mixing together the ones I already have to create new outfit ideas, cause sometimes you just need to add the right accessory to make the difference! Like this minimal circle hair pin I’ve been wanting for a while and that I’ve finally decided to DIY. You’ll be surprised by how easy it is! Settembre, per me, non è solo il mese più creativo dell’anno, ma significa anche (nuovi) outfit Autunnali e cambio di stagione! Mi piace scegliere nuovi capi di abbigliamento, ma adoro ancora di più mixare tra loro quelli che già ho per creare nuovi look, perché spesso basta l’accessorio giusto per fare la differenza! Come questo fermaglio minimal a forma di cerchio, che ho desiderato a lungo e che alla fine ho realizzato io stessa. Resterete sorprese da quanto è facile farlo! For more hair accessories, click here. Happy new week! 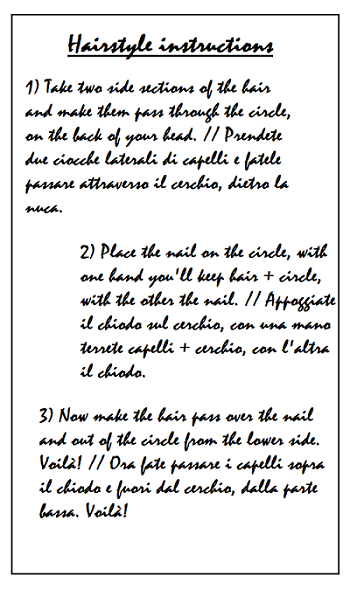 // Per altri accessori per capelli, cliccate qui. Previous Post HELLO SEPTEMBER: SOME THOUGHTS + FREE PRINTABLE TO DO LIST!